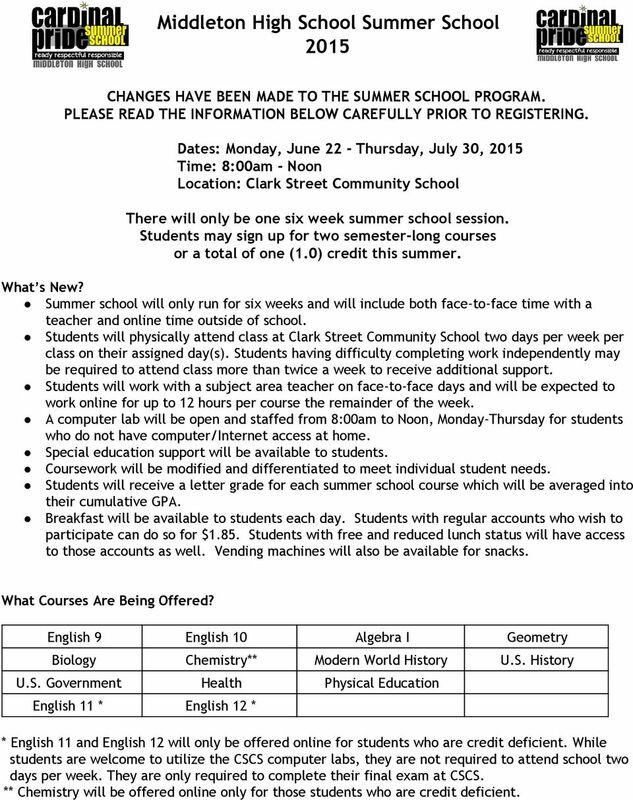 Download "Middleton High School Summer School 2015"
1 Middleton High School Summer School 2015 CHANGES HAVE BEEN MADE TO THE SUMMER SCHOOL PROGRAM. PLEASE READ THE INFORMATION BELOW CAREFULLY PRIOR TO REGISTERING. Dates: Monday, June 22 - Thursday, July 30, 2015 Time: 8:00am - Noon Location: Clark Street Community School There will only be one six week summer school session. Students may sign up for two semester-long courses or a total of one (1.0) credit this summer. What s New? Summer school will only run for six weeks and will include both face-to-face time with a teacher and online time outside of school. Students will physically attend class at Clark Street Community School two days per week per class on their assigned day(s). Students having difficulty completing work independently may be required to attend class more than twice a week to receive additional support. Students will work with a subject area teacher on face-to-face days and will be expected to work online for up to 12 hours per course the remainder of the week. A computer lab will be open and staffed from 8:00am to Noon, Monday-Thursday for students who do not have computer/internet access at home. Special education support will be available to students. Coursework will be modified and differentiated to meet individual student needs. Students will receive a letter grade for each summer school course which will be averaged into their cumulative GPA. Breakfast will be available to students each day. Students with regular accounts who wish to participate can do so for $1.85. Students with free and reduced lunch status will have access to those accounts as well. Vending machines will also be available for snacks. What Courses Are Being Offered? English 9 English 10 Algebra I Geometry Biology Chemistry** Modern World History U.S. History U.S. Government Health Physical Education English 11 * English 12 * * English 11 and English 12 will only be offered online for students who are credit deficient. While students are welcome to utilize the CSCS computer labs, they are not required to attend school two days per week. They are only required to complete their final exam at CSCS. ** Chemistry will be offered online only for those students who are credit deficient. 2 Who is Eligible for Summer School? Any student who received an F in any of the above courses Students who received a D+ or lower in some courses may be eligible to take a summer school course with teacher recommendation. This will depend on space availability within each course. Will Transportation be offered? This will be dependent on student need. When students apply for summer school there will be a place to indicate transportation needs. Are there any Fees for Summer School? No. There will not be any fees charged for summer school. What is the Enriched Physical Education Course? We are offering students the opportunity to take a P.E. class for regular credit, regardless of whether they failed P.E. The credit may be used to satisfy a student s regular P.E. requirement. Students may still take P.E. for credit recovery. 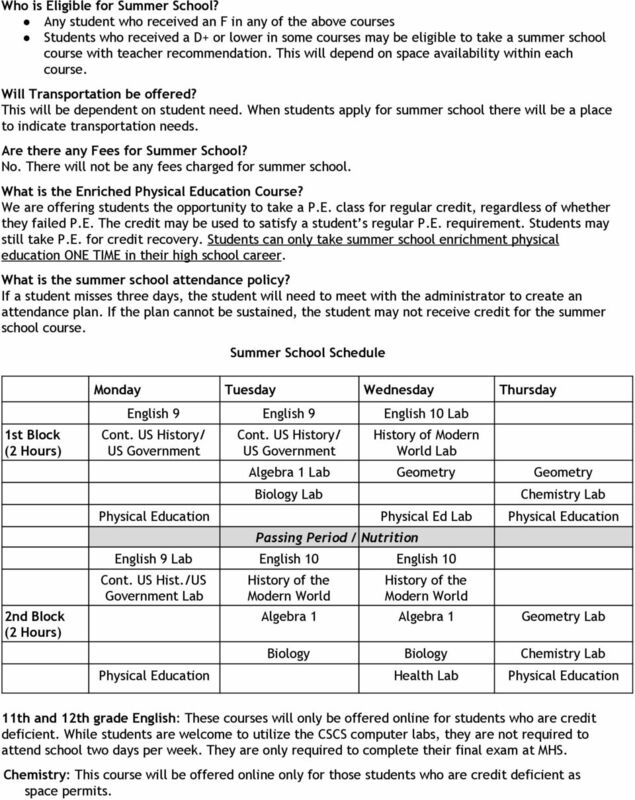 Students can only take summer school enrichment physical education ONE TIME in their high school career. What is the summer school attendance policy? If a student misses three days, the student will need to meet with the administrator to create an attendance plan. If the plan cannot be sustained, the student may not receive credit for the summer school course. Summer School Schedule 1st Block (2 Hours) 2nd Block (2 Hours) Monday Tuesday Wednesday Thursday English 9 English 9 English 10 Lab Cont. US History/ US Government Cont. US History/ US Government History of Modern World Lab Algebra 1 Lab Geometry Geometry Biology Lab Chemistry Lab Physical Education Physical Ed Lab Physical Education Passing Period / Nutrition English 9 Lab English 10 English 10 Cont. US Hist./US Government Lab History of the Modern World History of the Modern World Algebra 1 Algebra 1 Geometry Lab Biology Biology Chemistry Lab Physical Education Health Lab Physical Education 11th and 12th grade English: These courses will only be offered online for students who are credit deficient. While students are welcome to utilize the CSCS computer labs, they are not required to attend school two days per week. They are only required to complete their final exam at MHS. Chemistry: This course will be offered online only for those students who are credit deficient as space permits. 3 Physical Education: Students will be required to attend both days of Physical Education. If conflict with another course arises, more online work may be accepted in return for class time (recovery only). 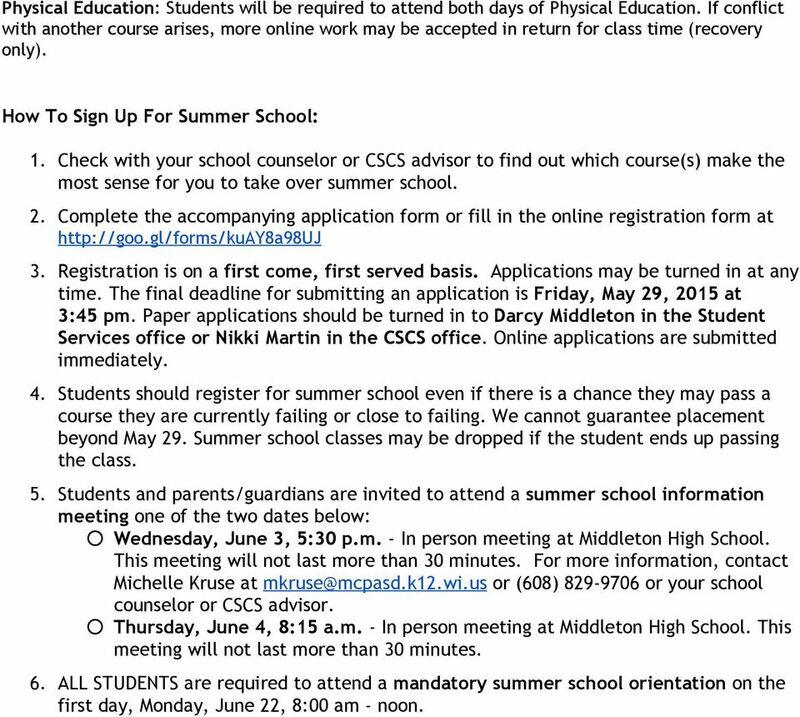 How To Sign Up For Summer School: 1. Check with your school counselor or CSCS advisor to find out which course(s) make the most sense for you to take over summer school. 2. Complete the accompanying application form or fill in the online registration form at 3. Registration is on a first come, first served basis. Applications may be turned in at any time. The final deadline for submitting an application is Friday, May 29, 2015 at 3:45 pm. Paper applications should be turned in to Darcy Middleton in the Student Services office or Nikki Martin in the CSCS office. Online applications are submitted immediately. 4. Students should register for summer school even if there is a chance they may pass a course they are currently failing or close to failing. We cannot guarantee placement beyond May 29. Summer school classes may be dropped if the student ends up passing the class. 5. 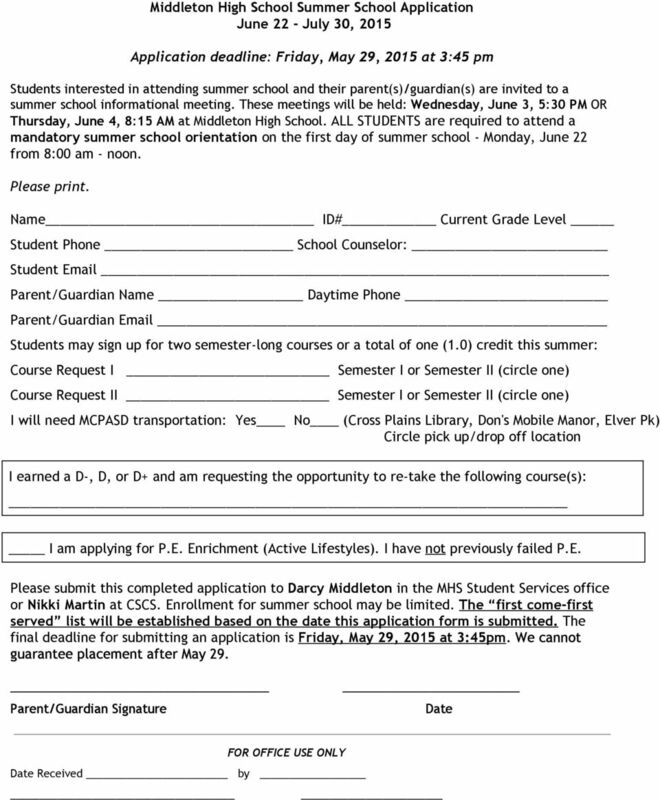 Students and parents/guardians are invited to attend a summer school information meeting one of the two dates below: Wednesday, June 3, 5:30 p.m. - In person meeting at Middleton High School. This meeting will not last more than 30 minutes. For more information, contact Michelle Kruse at or (608) or your school counselor or CSCS advisor. Thursday, June 4, 8:15 a.m. - In person meeting at Middleton High School. This meeting will not last more than 30 minutes. 6. ALL STUDENTS are required to attend a mandatory summer school orientation on the first day, Monday, June 22, 8:00 am - noon. What is the Early College of Macomb? Summer semester classes, traditional and online, will be offered at eight of our district high schools! Online, off site classes will also be offered. NOTE: CHS offers online courses in English, Social Studies, Science, Math, Spanish, with limited AP courses and electives.